Be sure to bring your rain gear and your sense of adventure. Most festival projects already take place in sheltered locations, and after all, what else brings Minnesotans together like a little bit of weather? Who knows—the light and atmospheric conditions of a possible shower or two can be a surprising poetic addition to a projection piece, or heighten the meaning of a participatory project—that’s the magic of bringing art out into our public places. It’s truly an adventure, and one we’re so excited to share with you on Saturday. In the case of weather-related changes on the night of the festival, the best place to check for updates in real time is on our Facebook page or Twitter (@Northern_Spark or #nspk). Look for the #nspk hashtag. 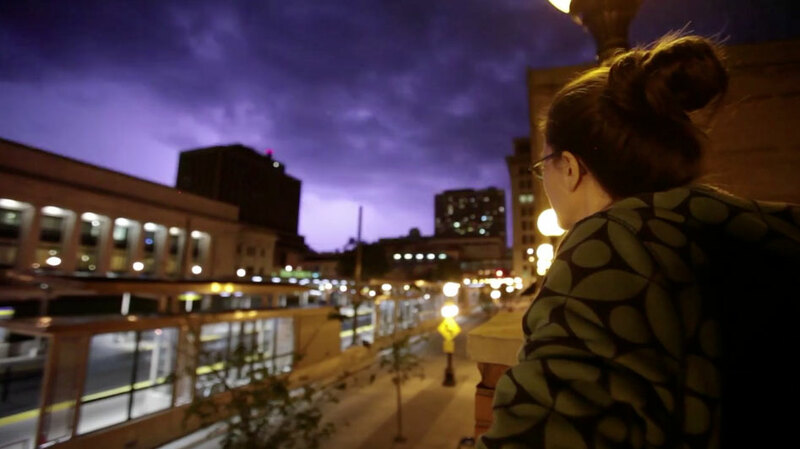 Also check with individual venues or ask a friendly volunteer at a Northern Spark Information Hub. Extreme weather may delay some events or require projects to be altered. • If you don’t see a project on the green plaza, look for it on the outdoor covered arcade in front of the Convention Center. B29 Emily Johnson/Catalyst – Be Mountain (Shore preview) at 10:30 pm moved to Mill City’s covered train shed. Enter near Guthrie/Chicago Ave.
B32 Benjamin Entner, Ego Sum – moved to The Soap Factory – now open all night!